Stratford upon Avon is the perfect destination for visiting groups. The charming medieval market town nestling in the heart of England is best known for being the birthplace of William Shakespeare. Since the early 1700’s, visitors have been visiting to explore the ancient town to pay homage to one of the world’s greatest writers. Many of the present half-timbered buildings were here before Shakespeare was born! But what of the lesser known Stratford? The meandering River Avon for example, with its prolific wildlife and frenetic boating activities, boasts a working gondola. It was once owned by Marie Corelli, extrovert author from the 1800’s and the ‘Barbara Cartland’ of her day. Marie Corelli would sail along the river in her gondola (with Italian gondalier), waving regally to her adoring public. A closer look at some of the lampposts may cause surprise. The observant passer-by might spot one from his home city or country! Stratford hosts a unique collection of around 40 different lampposts from all over the world. Those from Israel and Spain are particularly eye catching. One of Stratford’s many American connections is Harvard House, situated in High Street and built in 1596. It was the home of Katherine Rogers, whose son emigrated to America and established the library around which Harvard University is built. Next door is the famous Garrick Inn, on the site where the plague started in Stratford in 1564. Over 200 people succumbed to it’s deadly embrace. No wonder the Garrick is said to be one of Stratford’s ‘haunted’ buildings! A visit to Holy Trinity Church will reveal the ‘cursed’ grave of William Shakespeare. Why is there a curse on the stone, why are some members of his family not buried with him and why is he buried so close to the alter? There are gruesome stories relating to the Clopton Chapel within the church and an unsolved churchyard murder, to freeze the senses! The best way to unearth Stratford’s secrets is to book a private bespoke walking or coach tour with Stratford Town Walk. Literally walk through the pages of history to see the highlights in the town and hear the Shakespeare story. Depending on the time available and the interests of individuals, the tour can be adapted to suit the needs of the group and may include a visit to one or more of the Shakespeare Houses or Shakespeare’s School, a relaxing cream-tea river cruise or other attraction. A group guided tour can cost as little as £120 (excluding entrances). In addition, every customer is given a ticket with 5 tear-off vouchers, to save money at a range of shops, restaurants, pubs and attractions. Ideal for free time. Stratford upon Avon is a truly magical and mystical place. Please make the best use of your time here. Your visit may last a moment, but memories last a lifetime. Shakespeare’s Schoolroom & Guildhall offers generous discount for groups of 15 or more people. The Standard group rate is 20% discount with the Super Saver rate of 25% is applied to any group bookings when payment is received at least 14 days in advance of the visit. Bespoke experiences can also be developed for groups with including the provision of refreshments. Throughout the year we offer a great value Family Super Saver Ticket for 2 adults and 2 children to get entry to three of Stratford’s leading attractions; Shakespeare’s Schoolroom & Guildhall, Stratford-upon-Avon Butterfly Farm and The MAD Museum. The cost of the ticket is £57, a 15% saving on buying the tickets individually. An extra child place can be bought in addition to a family ticket for £9.60. A visit to Stratford-upon-Avon’s Butterfly Farm, the UK’s largest tropical butterfly paradise, makes a truly spectacular day out. Rain or shine, discover many of the world’s most beautiful butterflies in an exotic environment of tropical blossom with splashing waterfalls and fish-filled pools. Watch in awe as these spectacular and vibrantly coloured butterflies fly and feed around you. Introducing the new tour, Discover the Maya, a rainforest civilisation – Find out about the ancient Maya, their culture, traditions and how they were able to build a complex civilisation within the rainforest. See for yourselves the crops they farmed in the rainforest and are still being farmed today and discover their ancient artefacts that have been replicated and are now on display throughout the Butterfly Farm. The popular Meet the Mini-Beasts tour begins with a brief introduction to the Butterfly farm, its’ inhabitants and the tropical rainforest environment. The tour then moves into the Rainforest Flight Area where there are hundreds of beautiful tropical butterflies flying around. You will be able to view all stages of the life cycle, including a range of caterpillars in the Discovery Zone and watch butterflies hatch from their chrysalis in the Emerging Case. Both types of tour end in a mini-beast handling session where you can hold creatures such as Madagascan hissing cockroaches, African land snails, giant millipedes and a variety of stick insects. If as a group you would rather visit the Butterfly Farm without a guide and go around at your leisure you can just have the introductory talk in the Education Area, followed by the mini-beast handling and then go around the farm or an introductory talk only before you explore the farm. All pre-booked groups of 10+ receive a guided tour at no extra cost, subject to availability. Tours last for approximately one hour and are led by an experienced member of the Education Team, who present all aspects of the Butterfly Farm in an engaging and informative manner. All groups are greeted in the Education Area. This is the place to find out about the fascinating story of Stratford-upon-Avon Butterfly Farm, its links to the rainforests of Belize and the amazing ancient Maya civilisation. The walls are full of beautifully illustrated interpretation telling our story, the story of the Maya and informing of where in the world our different species of butterflies come from. Open every day of the week except Christmas Day. For more information please visit the website at www.butterflyfarm.co.uk or telephone on 01789 299288. The Stratford Literary Festival will be packing some of the most respected writers and high-profile journalists into a weekend of events this winter. As well as the internationally best-selling author, Jodi Picoult, who will be appearing on Sunday 28 October, the Festival will be hosting a programme of events from 9 – 17 November. The names appearing include the veteran broadcaster, Sir Michael Parkinson, sharing his admiration for the legendary footballer, George Best; historian and TV presenter, Lucy Worsley OBE, who will be talking about her latest book The Many Faces of Queen Victoria, and Channel 4 News presenter Cathy Newman whose new book, Bloody Brilliant Women, highlights some forgotten but ground-breaking women from history. Two leading BBC journalists, World Affairs Editor John Simpson CB, and Economics Editor Kamal Ahmed, will be talking about their new books. John Simpson, who has covered many major conflicts around the world, brings his experiences to his debut novel, Moscow, Midnight, and Ahmed’s book is an acclaimed and moving account of growing up in 1970s Britain amongst a culture of racism and suspicion. Groups of over 10 will receive a 10% discount. When you are visiting Stratford visit the free Arts Fair Discover:Gather:Give #Cafdgg in the historic Stratford-upon-Avon Town Hall over the weekend of November 2nd to 4th November. They have brought together 40 exceptional artists exhibiting more than 500 pieces of original and passionately created art, offering an exciting and eclectic mix of paintings, illustrations, ceramics, jewellery, glasswork, decoupage, textiles, wood turning, digital art, sculpture and book binding. 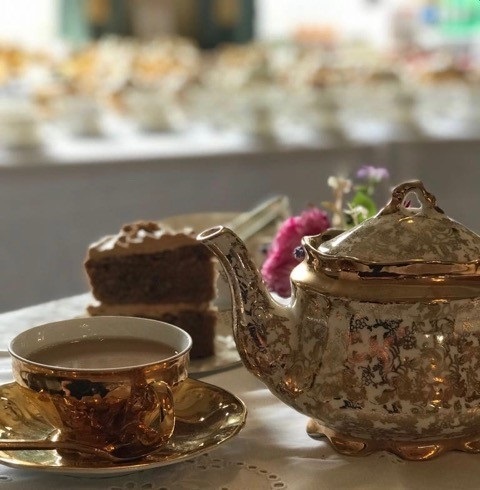 Also in the Ballroom upstairs they have the incredible shimmering Golden Cup Cafe where they serve the best coffee and cake in Town in elegant vintage golden tea sets, on crisp white linen with fresh flowers – a haven to put your feet up and enjoy…..
Hotel Indigo to open in November.. Formerly The Falcon Hotel, the Grade 11 listed historic building dates back to the 16th century and is currently undergoing a restoration project in excess of £10 million. Once open there will be 93 guest rooms, a gym, private dining rooms and a board room. 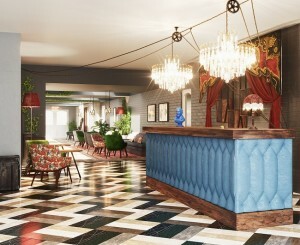 Also on site will be The Woodsman restaurant, a wine cellar, cocktail bar and The Falcon Tea Rooms. 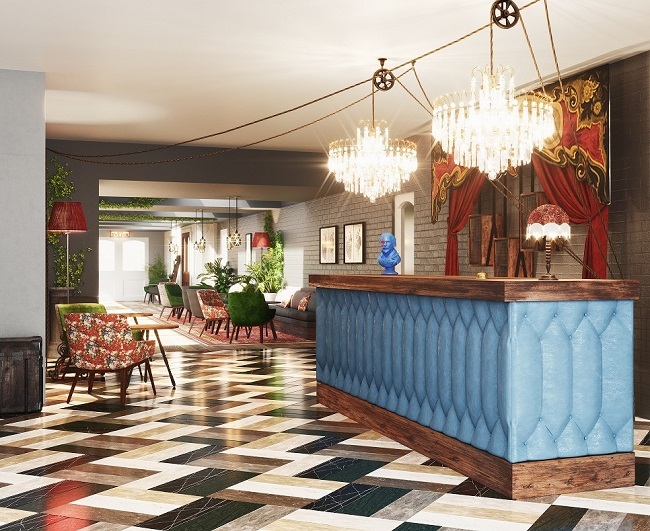 Simon Hall, General Manager at Hotel Indigo Stratford-upon-Avon said “We look forward to hosting our two recruitment days and meeting a host of candidates that will help re-launch our exciting new hotel. We are looking for personable, positive and passionate people who want to be part of our growing brand. If you love telling stories and have a passion for our amazing neighbourhood, there could be an opportunity for you at Hotel Indigo Stratford-upon-Avon”. 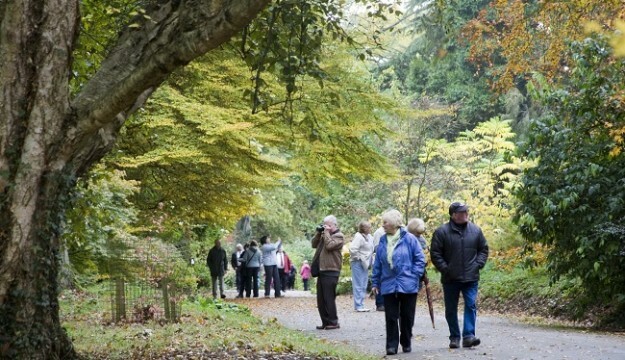 Home to one of the largest private tree collections in the country, Batsford Arboretum is a magical place to visit all year round; enjoy early colour from the snowdrops, spring-flowering bulbs and spectacular Japanese flowering cherries; escape the heat under the tree canopy in summer and prepare to be amazed by the outstanding autumn colour! Visitors can enjoy gorgeous home-baked lunches and afternoon teas in the Garden Terrace Café; wander through the beautiful walled-garden plant centre and catch up on some retail therapy in the Gift and Garden Shops. Special group rates are available for parties of 20 or more booked in advance; there’s free coach parking and drivers get a meal voucher and free entry to the arboretum. A meet and greet service is offered whenever possible and guided tours and special group catering can also be arranged. Drive on to the British Motor Museum.. The British Motor Museum is home to the world’s largest collection of historic British cars. Whether you are young or old, there is sure to be a car in the museum’s collection of over 300 that you will recognise, be it reminiscing over the first car you ever owned or the cars you aspire to. For those interested in photography, the Museum is offering three workshops. ‘Cars through the Lens’ on 6 October is aimed at the aspiring amateur photographer while ‘Lights, Camera…Cars’ on7 October focuses on developing lighting skills for the more advanced. Finally ‘Cars through the Lens goes Studio’ on17 November is perfect for those looking to develop photographic techniques, composition and lighting in a home studio setting. They will be delivering five art based workshops,the first‘Sketching and painting Land Rovers’ on 7 October will be led by artist and Land Rover enthusiast Maria Clancy, and will cover how to capture the essence of these popular vehicles. Richard Cook, retired art teacher and accomplished pencil sketcher will deliver a more general sketching workshop ‘Sketching from Automotive History’ on 20 October followed by ‘Automotive History in Watercolour’ on 21 October giving participants the chance to bring life to their sketches with watercolour. Richard will also deliver two workshops exclusively on perspective. ‘Automotive Sketching in Perspective’ on 24 November which will cover techniques such as one and two point perspective, vanishing points and the horizon line, and then an advanced perspective workshop on 25 November for artists wishing to gain an understanding of 3 point perspective while sketching their favourite cars. 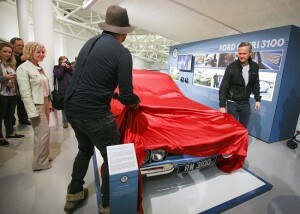 Car S.O.S presenters Fuzz Townshend and Tim Shaw have opened a new exhibition featuring cars from National Geographic’s popular motoring TV show Car S.O.S. The exhibition features 7 cars that have been rebuilt by the Car S.O.S team including 3 still shining from restoration in the most recent series. On display is a pre-war Austin ‘Tilly’ truck which underwent a sympathetic overhaul, a vibrant yellow Lancia Delta Integrale with a touching back story and a rare AC Aceca sports car along with four others; MGA, Volvo P1800, Aston Martin DB6 and a Ford Capri RS3100. Graphics and clips from the relevant episodes run alongside each of the cars detailing the many technical dilemmas Tim and Fuzz had to get the cars back to their best. They will also give an insight into some of the personal stories and challenges faced by each of the cars’ owners. The Car S.O.S Exhibition is now open until the end of February 2019 and is included within the Museum entrance fee. New for 2019 is an exciting ‘Futures’ exhibition which is opening in the summer, which along with Museum’s interactive exhibits tell the story of the British motor industry from the 1890s to the present day, and how cars and the way we travel in the future may change! Located off junction 12 of the M40, Warwickshire, the Museum offers discounted entry for pre-booked groups of 12 or more (just £10 per person). Organiser and driver benefits and private guided tours available. Ample free coach parking. Archive Live! is a unique opportunity for people to find out what an Archive is and what an archivist actually does. On Friday 5 October the Museum’s Archive team will be taking over the British Motor Museum social media feeds on Facebook, Twitter and Instagram with a series of posts and live ‘behind the scenes’ sessions. Throughout the day the team will give an insight into what archivists do; there will be opportunities to learn more about documenting and conserving historic material, as well as take a ‘tour’ round the Archive Store. Although the Museum’s archive holds information and the social history of the British car manufacturing history, the principles of an archive are the same regardless of the collection. Whether it be a personal collection of family photos or a club or business archive, Archive Live! hopes to give watchers, tips and advice on how to look after their own old documents, brochures and photographs. Throughout the day you can tweet questions to the Archive team using #AskAnArchivistBMM and they will do their best to answer them over the course of the day. To find out more about Archive Live! including a timetable of what will be streamed, follow British Motor Museum on your preferred social media channel and we will keep you posted in the build-up to the day. Motoring enthusiasts and local history enthusiasts will not only get to see behind the scenes of the Archive, they will also be able to find out more about its latest project ‘The Art of Selling’ which will see the cataloguing of the unique collection of sales and press material originating from British Leyland – part of the ‘Archives Revealed’ cataloguing grant awarded in June this year. Who may be interested in Archive Live? Whilst Archive Live! may appeal to those who work in the Museum and Archive industry, it will also be of interest to private individuals and clubs starting out with an Archive, as well as local history and motoring enthusiasts. The British Motor Museum houses the collections of the British Motor Industry Heritage Trust – over 300 cars spanning the classic, vintage and veteran eras and a fabulous archive of film, photographs, personal papers and business documents. The address is British Motor Museum or British Motor Industry Heritage Trust, Banbury Road, Gaydon, Warwickshire CV35 0BJ.